A criminal record details your brushes with the law. To get a copy of yours, contact the law enforcement agency you had dealings with, or the FBI if you have a record in more than one state. Although procedures vary, the process typically includes completing an application, submitting your fingerprints and paying a fee. If you find information on your record is incomplete or erroneous, you can request to have your record corrected. To get your criminal record from the FBI, complete and mail an Applicant Information Form, which is available online from the FBI's website. You'll need to provide information such as your name, address, birth date and Social Security number. Along with the application, you'll have to submit a copy of your fingerprints, along with the current fee. 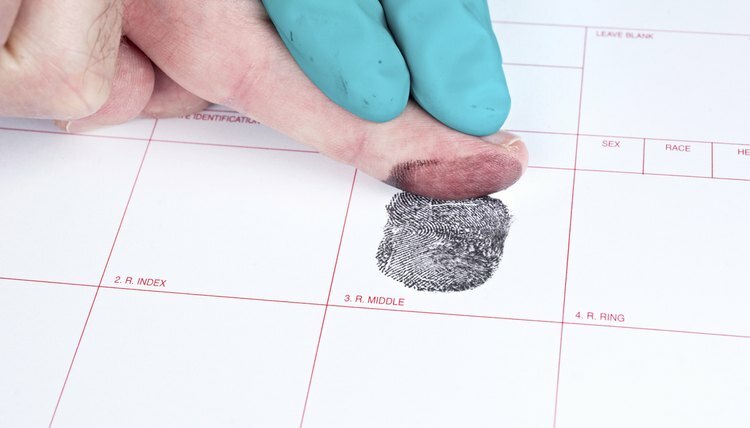 You can usually have your fingerprints taken by a local law enforcement agency, which might require an additional fee. The procedure is typically similar for submitting requests to local and state law enforcement agencies. Once you obtain a copy of your record, ensure the information is accurate. This may be particularly important if you have been the victim of identity theft or are applying for a job that requires submitting a copy of your criminal record, such as that of a schoolteacher or childcare worker. If you have been acquitted of a crime or had a portion of your record expunged, or removed from public view, confirm that the acquittal is listed or expunged information no longer appears. You're not stuck with the information on your criminal record if it is incomplete or inaccurate. However, just as with ordering your criminal record, the procedure for challenging its contents varies. For example, to challenge the criminal record provided by the FBI, you have two options. The first is to challenge the record, in writing, directly with the local or state law enforcement agency that provided the information to the FBI. The second way is to send a letter directly to the FBI listing the erroneous or incomplete information along with any supporting documentation you have. The FBI will conduct an investigation and notify you of its findings, as well as correct your record if necessary. Criminal records maintained by the FBI and other law enforcement agencies contain more than conviction information. Details such as arrests, punishments, not-guilty verdicts, dismissals and parole violations are also a part of the official record. Personal details are also listed, such as name aliases, identifying marks and fingerprints. Jane, Mary. "How to Get a Copy of Your Criminal Record." , https://legalbeagle.com/4778804-do-copy-criminal-record.html. 10 April 2017.